The village of Gurnee is in Warren Township in Lake County, IL. It is approximately 45 miles north of Chicago and 50 miles south of Milwaukee, WI. 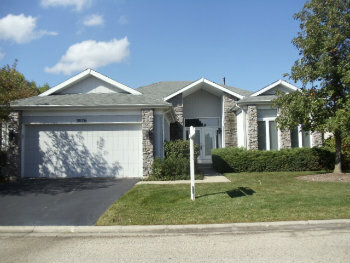 Real estate in Gurnee, IL includes homes and condos. There are homes with four and five bedrooms that cost over $500,000. Some of the homes in this price range overlook one of the village's golf courses. Many homes for sale in the village have two or three bedrooms. Condos with one, two, or three bedrooms are available. Some condos are less than three miles from stores and within a mile of several restaurants. The first settlers in Warren Township came to the area from Warren, NY during the 1830s. The building that now homes the Warren Township Historical Society was a tavern that served as a stagecoach stop on the route between Chicago and Milwaukee. Gurnee was originally named Wentworth. The village's first post office opened in 1847. Trains on the Chicago, Milwaukee, and St. Paul Railorad began running through the village in 1873. The village's name was changed to Gurnee Station in 1874, and the name was later shortened to Gurnee. Gurnee residents can read a detailed history of the town here. People who purchase homes in Gurnee IL can easily visit attractions such as Six Flags Great America. This amusement park in Gurnee has rides and entertainment. There are thrilling roller coasters for adventurous visitors and slow rides for small children. The park has live entertainment and parades. Gurnee residents who like to shop will enjoy being close to Gurnee Mills. This mall in Gurnee has over 200 stores. Clothing, shoes, accessories and items for the home are only a few of the types of merchandise available here. Gurnee golfers can enjoy nature while they play at the Bittersweet Golf Club. This 18-hole public golf course is set in the middle of trees, wetlands and wildflowers. Gurnee Days is one of the village's annual events. Residents gather every August for a weekend of live entertainment, carnival rides, games and food.